We are a group of experienced welders, designers and iron workers. We are experienced in all kind of Iron work, including: fences, gates, window grills, iron decks, balconies, fire escapes, ornamental railings for commercial and residential use. At Ramos Iron Works we all know your satisfaction is the key to our productive business. Being employed as any single operator permits us to individually help each client right from the start of the project to its finalization. We've been running a business for many years associated with basic construction. Our tasks vary from fresh family house construction as well as remodels, to be able to custom installations and also monitor properties. Our service region covers across Everett - MA. We attempt for your highest happiness and support it with Client Recommendations. Thanks again regarding visiting us. We hope you'll provide us with an opportunity to provide you with a free estimate when the time comes you need our services - we're confident that you'll be impressed by our friendly, low-pressure, knowledgeable sales staff. Give us a call the next time you need a welder, we are located in Everett MA and have clients all around MA and close states like New Hampshire or Rhode Island.Exterior ironwork can serve to enrich your current exterior facade. Ironwork imparts a quiet richness and variety to some building as well as neighborhood. It is used on doors and windows for protection, on steps and balconies regarding safety, and around meters and flower beds regarding privacy and aesthetics. Guard and enhance your home or business concurrently using attractive iron. Internal wrought iron balcony railings offer a triple operate. Designed for an attractive and decorative operate, they increase focal point and magnificence to any residence, or 2nd level of a property,-but also for basic safety. Another great function which makes these kinds of balconies so popular, is the resistance to corrode. 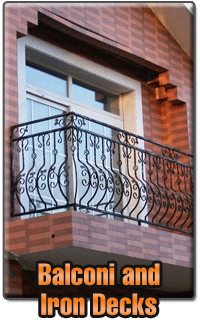 Wrought iron balconies offer a real advantage, and is an obvious winner above other metallic choices. It really is strong and sturdy and will never split, decompose, or extremely high due to weather conditions. It is substantially lighter than other rail materials there is no anxiety placed on the structure structure at any time. The Ramos Iron Work will be very happy to consult and advise you, addressing all questions concerning wrought iron balconies, and any other steel and Metal product layout needs for your residence or company. We will cooperate with you all the way in the design and exceptional creation of your iron porch. A Ornamental iron railing include strength and elegance to your home or even business. Ironwork has been used in Architecture for 100’s of years and is forever in style. Distribute your ideas or perhaps let us modify an iron railing in order to perfectly emphasize the exterior or interior of your house. Whether it is fully functional or totally artistic we can provide you with one of a kind pieces. Our own iron balusters include personality and character to stairways mixing architecture characteristics with expert craftsmanship. The actual powder covered finish can last for years. Iron balusters bring a replacement regarding wooden types, adding strength and durability to staircase systems and therefore are stronger and heavier as compared to hollow straightener balusters. When put in with our epoxy kit, they’re a formidable combination that with withstand even the most aggressive teenage parties. The endurance of the end on the iron balusters comes from the painstaking surface preparation that contains acid etching, sandblasting and electrostatic natural powder coating. Our expert staff of tradesmen are experienced and able to modify to match the layout of your home.GUARD RAILSClassic vertical pickets to extremely decorative models to commercial public room code-compliant applications.HANDRAILSSimple and utilitarian to American dental assoc . – compliant to elaborate and decorated – solving both cosmetic and useful considerations.WALL-MOUNTED HANDRAILSFabricated specifically for enclosed spaces, such as downstairs room or internal hallway stairways. Ramos Iron Work’s custom ornamental iron secure fencing gallery shows our sophisticated range of custom metal manufacturing products and solutions — expertly carried out and set up. Whether fencing out the deer, childproofing the actual swimming pool region, or attaching the circumference of your property, we now have the skill, knowledge, and capabilities to handle any project, any kind of size. Create a distinct atmosphere all your very own using custom ornamental iron or custom made ornamental light weight aluminum to meet your needs. Once you’ve determined to encircle your property, terrace or swimming pool with ornamental fencing, achieve this with the aid of an expert. Picking out the ideal fence pattern entails many elements, the most important is to maintain the strength of your house’s exterior. Ronaldo and his staff works with you to design a fence which compliments the home’s design design, which looks excellent and fits your budget. Powdered coating is also available to organize with most home palettes. Check out the Color Graph and choose a color that you will enjoy for many years in the future. Iron walls don’t have to be simple in design, there’s incredible ways to put in a splash of design to any project simply by including a search component, yet another interior horizontal railing or even picket collars. Iron fencing will be durable and delightful. Iron secure fencing can allow you to definitely view your surroundings by still protecting you concurrently. If you prefer more privacy, add punctured metal or solid plate to your fence solar panels. Perforated panels make it more challenging to see by means of without entirely blocking the outside. Iron plate, on the other hand, is actually solid permitting you total level of privacy. If your intent is to wall in an area for practical purposes rather than with regard to beautification, then pre-manufactured fencing may be your best option. We utilize a supplier in which manufactures an excellent product, it often costs less compared to custom made, which is still very attractive. The beauty of your own home’s entryway, front yard, deck or perhaps pool could be greatly improved by the addition of an elegant wrought iron gate. Few other design elements have so powerful a reputation because this hallmark associated with elegance, big difference and refinement. Custom designing a stunning wrought straightener gate is the ideal opportunity to give a personal contact that reflects your style and compliments your homes architectural style. Set yourself apart through custom developing a entrance that tends to make your residence’s entrance a “grand entrance”. The right entrance will make the right frame for the newly developed walkway, entryway or outside landscaping. Personalize your door further by choosing a specialty shade, powder coating or aging. The most important part of installing the wrought iron entrance is to assist ensure the safety of your family. A self securing, self shutting gate, helps you to detour children from wandering in to swimming pool as well as hot tub areas. A gate can avoid strangers from entering your premises. It can even help keep animals safe from straying off or getting into those “off-limit” locations. An automatic driveway gate not merely makes life easier, but adds an additional measure of security. For relieve, your door can be opened up while residing in your car. You might use a state from the art phone entry program to allocate specific accessibility codes to be able to family, friends and servicing people.Many of the telephone accessibility systems today connect to your home computer letting you track items, and background.